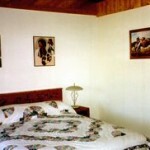 Our facilities include five spacious bedrooms. The Drange family brand, the U Running 3, is proudly burnt into each of the headboards of the beds. It’s our promise to you that we’ll make your stay as pleasant as we possibly can. Please remember that smoking is allowed outdoors only. No pets are allowed in the lodge. Our first room features two queen-sized beds. It celebrates the history of Montana by saluting two big influences, the railroad industry and gold mining. The decorations in this room include model trains and a gold-mining pan. This room, like all the others, has a private entrance and a private bath. 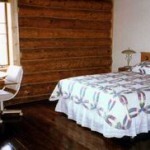 This photo of our second room shows the beautiful wood floors that we have here at Burnt Out Lodge. This room even has a bear skin rug hanging on the wall! 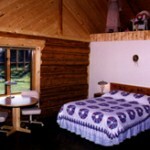 Our third room is decorated with an American Indian theme. All of our rooms have a great views. From this room you can see the creek that runs by Burnt Out Lodge. Note that all of our rooms feature handmade quilts. 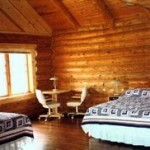 This photo of our fourth bedroom shows the architectural style of the lodge. Dolls and an antique dress form add a delicate touch to this room. 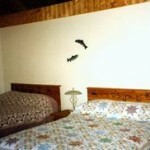 Our fifth room features two queen-sized beds and is decorated in a western theme. Like this site? Share or save our link! © 2019 Burnt Out Lodge.